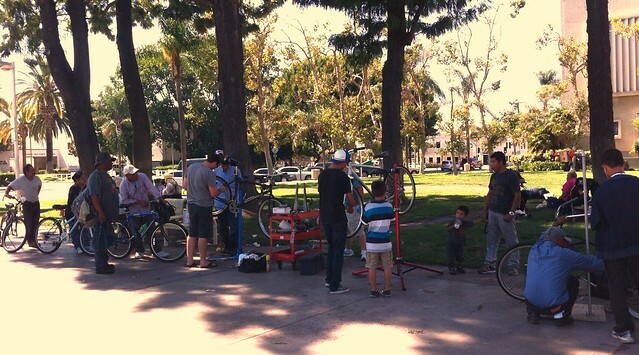 Just this past Sunday we gathered some volunteers to help out with the Mobile Bicycle Repair Unit. We had a mix of mountain bikers and bike commuters. We had a total of 4 work stations. From left to right, Andrew C., Seth, and Jon A. Sometimes repairs were a team effort. Officer Ben was on site to help out. He was our translator for the day. We welcome volunteers of all ages. This is Little Andrew C. He was very helpful in doing whatever we needed him to do. 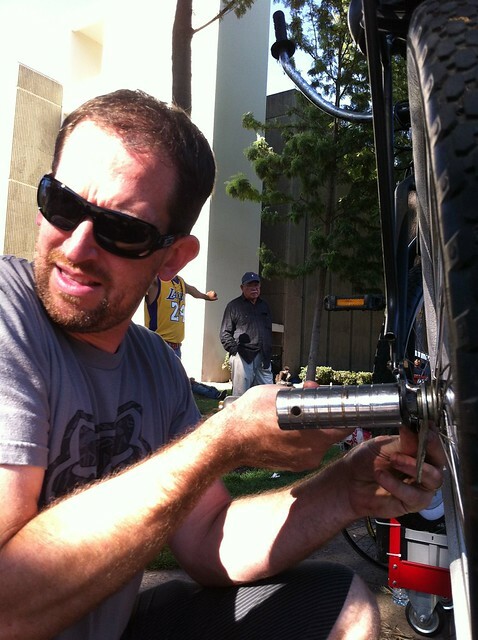 From lubing chains, to pumping tires, he would put in 100% for each task. In fact, he was showing Gabe Thunda how it’s done. This is actually Gabe’s second time coming out; he’s got a great heart in wanting to serve. Much like Andrew C., he puts so much effort into any task given to him. 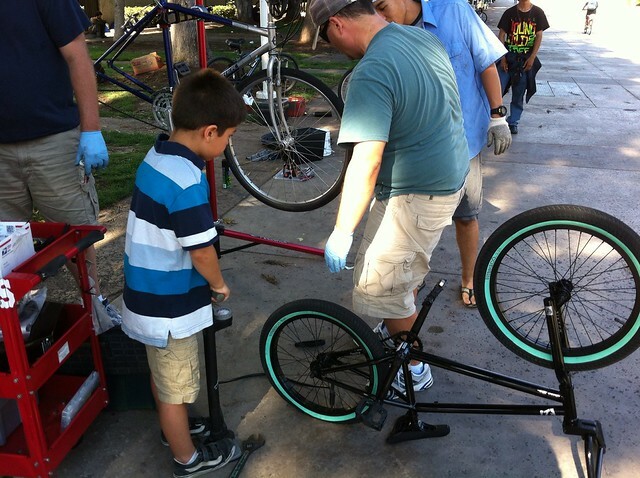 One of our other young volunteers is Joey H. Though he hasn’t had much experience in working on bicycles, he was out there willing to learn and to serve. Andrew “Doc” Li (wearing bandana) was there again. We call him Doc for the mere fact that he’s a real life Doctor. 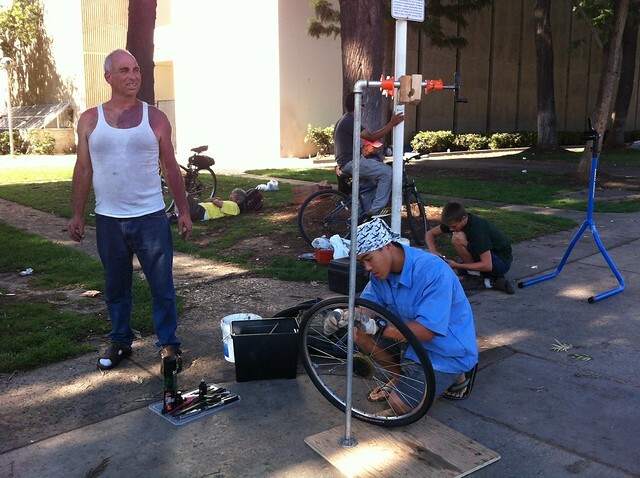 I really should ask him about a clicking sound that my jaw makes while I’m eating… Doc is working on a rear wheel that belonged to the gentleman on the left of the photo. This is Super Dan, He’s part of the MtnBikeRiders.com Race Team. 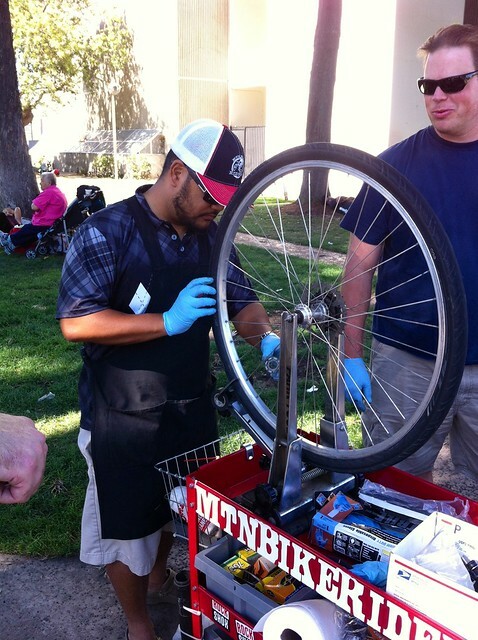 One of the services we do provide is wheel truing. The story behind this wheel is the owner said that someone inadvertently locked his bike at a rack. So he kept pulling and yanking on his bike to see if he could break the lock free. He did, but it messed up his rear wheel. When he came to us, the rear wheel was pretty bad. But I was able to true it enough where he could safely use his rear brakes. 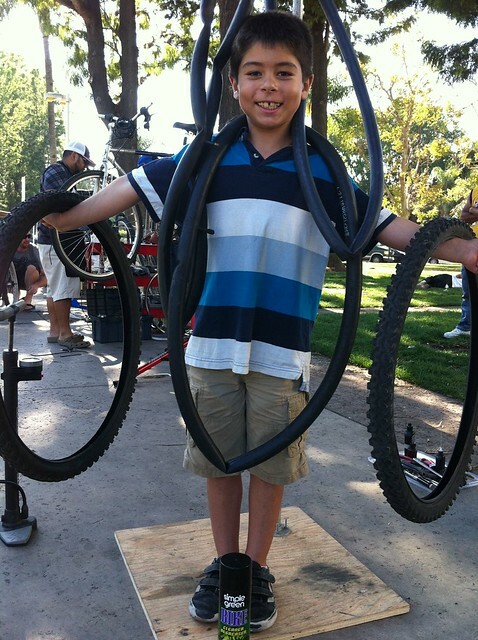 Little Andrew showing the tires and tubes we replaced that day. 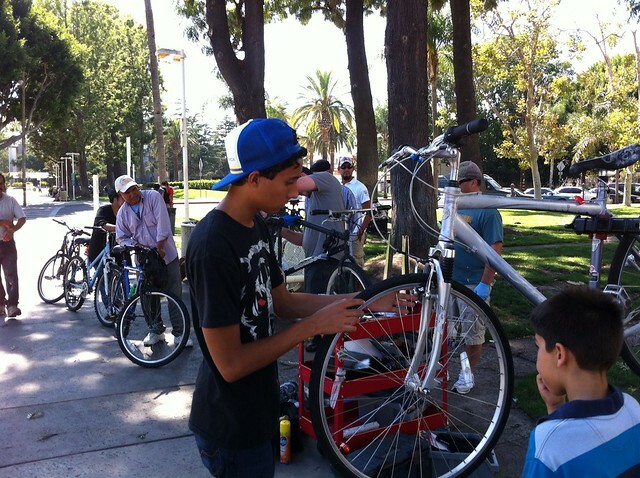 By the end of the day we had serviced quite a few bicycles. The most common repairs remain to be brake pads, chain lube and cables. I can’t even recall how many bikes we replaced shifter/brake cable and housing. So all those donations we received — from anonymous sources to the ones that were donated by people/companies we know — thank you! Your donations helped tremendously. 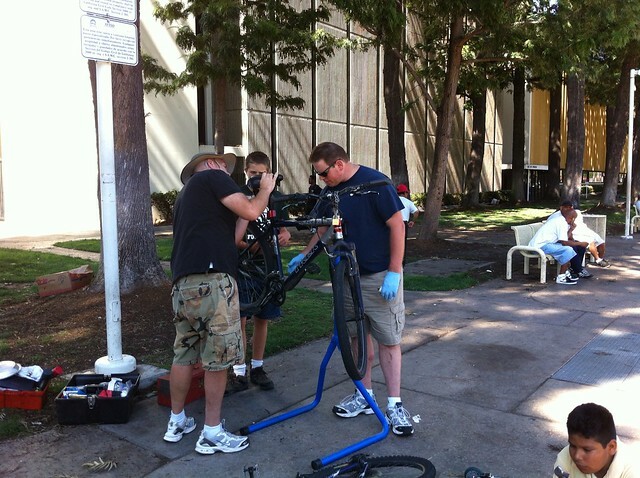 We’re hoping to get more items like brake pads, tubes, some chemicals and possibly a new work stand. I know that we have the manpower each time with ample amount of volunteers, but we just need more support via monetary donations and hard goods. 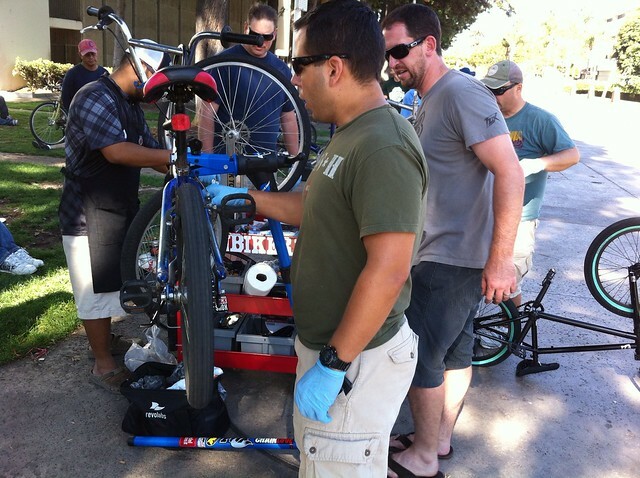 There are several ways you can help and I’ve written a guide showing you how to do so: Help Mobile Bicycle Repair.